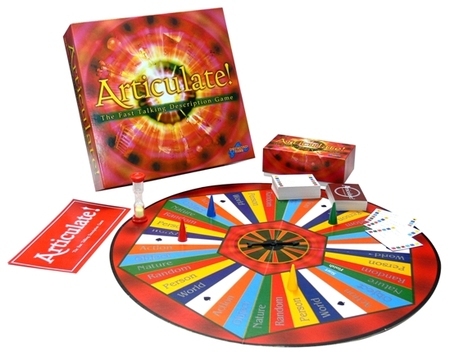 After writing about Bookchase the other day, I thought I should dedicate a day to writing about my favourite board game, Articulate. I first encountered this game in my A-Level English Language class and since then I have been hooked on it! The purpose of the game is to move around the circular board from start to finish. You achieve this by describing a word on the game cards without saying that word. For example, for the word ‘door,’ you might say, ‘you open it to come in a room.’ Once your team members guess the word correctly you can take another card. The number of cards you can correctly guess as a team equates to the number of spaces you can move round the board; the first team to make it all the way round wins. All teams start on the ‘object’ space on the board, so they have to guess as many objects correct in the time limit, and then move on that number of spaces. The category that they land on is what they will be describing on their next go. All of the categories appear on the game cards. If you land on the club symbol, you have to check on the game card which category has the corresponding symbol next to it. For every card you pick up this can be a different category. This game is immensely entertaining, and it has been know for groups of us to stay up well into the night playing it! However, the game can get pretty competitive!